The Scene Queue is the bottom pane in the main DreamLight Constellation window. Each of the rows in the table displays information about a queued scene. Some of the columns are user resizable by dragging the column dividers in the Scene Queue table header. Hovering over the Scene Queue table header cells will show the associated tooltips for the corresponding column. The currently selected scene row, if any, will be highlighted in yellow. You may click on a scene row and drag it up/down in the Scene Queue to change the order that scenes are being rendered. You may drag scene files from the desktop and drop them on the Scene Queue to add them to the queue for rendering. Drag the Node Queue – Scene Queue Separator up or down to resize the Node Queue vs. Scene Queue. Click this checkmark button to turn the Scene Queue ON/OFF. When the Scene Queue is off no further scenes will be loaded or frames will be rendered until the Scene Queue is re-enabled. Any frames currently rendering will continue rendering until they are finished. Click the Add Scene button or drag one ore more scenes to the button or Scene Queue to add scenes to the Scene Queue for rendering. When a scene row is selected and highlighted yellow the Move Up, Move Down and Remove Scene buttons become enabled. The Move Up and Move Down buttons may be used to move scenes higher or lower in the Scene Queue. Scene rows may also be clicked and dragged up or down in the Scene Queue. Scenes render in order from the top of the Scene Queue to the bottom. When a scene row is selected you may click the Remove Scene button or press the delete/backspace key to remove the selected scene from the Scene Queue. Click the Clear Scene Queue button to remove all scenes from the Scene Queue. When adding scenes to the Scene Queue the Scene Settings Panel will open as a sheet on Mac OS X or as a separate modal dialog on Windows. This panel is divided into three sections. The top informational header section, the middle RGB output section and the bottom frame range section. This panel shows the current settings as saved in the scene and allows the user to override these settings if desired as long as the scene folder is user writable so that a temp scene file with the new settings may be saved. The top section consists of the scene information header which displays the number of this scene in a possible list of scenes to be added and rendered in the case of multiple scenes being added at once. This information is displayed as “Scene # of #” just below the panel title. Below that is a read-only field that displays the full path to the current scene being added to the Scene Queue for rendering. You may click and drag in this filed to scroll it if the path is long and gets cropped. These settings only apply to the associated Save RGB settings in LightWave Layout’s Render Globals panel up to LightWave version 2015.3. They do not affect any other output settings such as the Save Alpha, Render Composite Buffers or any other output settings in any plugins such as exrTrader, etc. LightWave Layout 2018 does not have the Save RGB settings and instead uses Render Buffers for output. DreamLight Constellation does not yet support overriding render buffers. All other settings, such as Save Alpha, Render Composite Buffers and any plugin output settings will still be passed through to LWSN from the scene. They will continue to work properly as long as you set them properly in the scene before adding the scene to the render queue. They just can’t be overridden or changed by DreamLight Constellation yet. The middle RGB output section of the Scene Settings panel starts with the Save RGB checkmark button and an accompanying text readout. The Save RGB button will be set based on how that setting was saved in the scene file. The text readout will highlight green if the Scene Folder is user writable and red if it is read-only. If the folder is user writable then all the settings in this section will be enabled when the Save RGB button is turned on and the user may override any of the RGB settings. If any settings are overridden DreamLight Constellation will write a new hidden temp scene file in the same folder as the original scene with “_tmp_” and a number added to the end of the original filename. 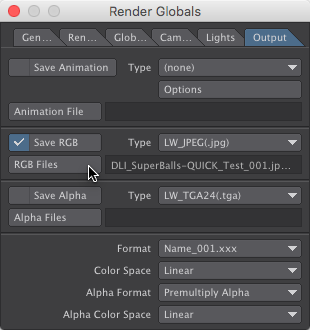 Click the RGB Output Folder button or drag-and-drop a folder from the desktop to the button or the read-only text field to set the path to the folder where rendered RGB image files should be saved. This field will default to the RGB Output Folder that was set in the scene file from within Layout, if any. The field will automatically highlight green if the folder is user writable and red if it is not. For best results, especially if using any of DreamLight Constellation’s Remap Remote Path preferences setting features, the RGB Output Folder should be located within the current Content Folder. That way all remote render nodes will be able to properly locate the RGB Output Folder. The RGB Output Filename Prefix editable text field will default to the filename prefix that was set in the scene file from within Layout. This is the base filename that will be used to name the rendered RGB image files and will be followed by the rendered frame number. When the scene RGB settings are enabled you may edit this field as desired. The RGB Output Image File Format pop-up button will default to the file format that was set in the scene file from within Layout. When the scene RGB settings are enabled you may click the button to select any format desired. The list is based on LightWave Layout 2015.2’s RGB image format list. The bottom section of the Scene Settings panel consists of three editable text fields for the render frame range. The fields default to the single frame range that was last set in the scene file. ScreamerNet LWSN only renders a single frame range. Any arbitrary ranges that may be set in the scene file will be ignored. You may set this frame range as desired whether the scene folder is user writable or not because the frame range is passed to LWSN as part of the command line, rather than read from the scene file. The First Frame should be set lower than the Last Frame if the Frame Step is positive. To render the frames in the reverse order set the First Frame higher than the Last Frame and use a negative Frame Step. When done click the OK button to add the scene to the Scene Queue or click the Cancel button to discard any changes and not add the scene to the Scene Queue. When adding a scene to the Scene Queue DreamLight Constellation scans the scene’s file path to determine what the Content Folder should be set to (based on where objects are found along the path). If this doesn’t match what’s set in DreamLight Constellation or in the Config File it will warn you about the mismatch and provide the opportunity to change the Content Folder. If you receive this warning you should check that you are using and setting the Content Folder correctly to render your scene with ScreamerNet. Other verifications are performed to make sure that Save RGB is enabled and that the RGB Output Folder is user writable with appropriate warnings given. Some of the Scene Queue table header columns are user resizable by clicking and dragging the column dividers in the Scene Queue table header to the left or right. Hovering over the Scene Queue table header column names will show the associated tooltips for the corresponding Scene Queue column below. Each scene row begins with an ON/OFF Switch that may be used to temporarily enable or disable individual scenes as desired. New scenes are only loaded and frames rendered for scenes that are currently enabled. Disabled scenes will finish whatever frames may be currently rendering but DreamLight Constellation will pause rendering of disabled scenes until they are re-enabled. The Scene Name column displays the name of each scene row. The name may vary slightly from the file name of the original scene submitted for rendering if changes were made at the time the scene was added to the Scene Queue. In such cases a new hidden temp scene is created in the Content Folder‘s Scenes folder and that temp scene is sent to the nodes to render. 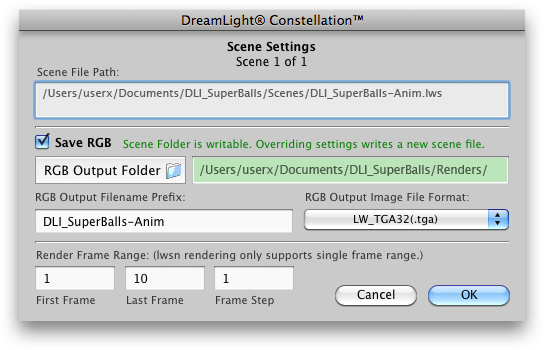 Such temp files are deleted when the scenes are removed from the Scene Queue or when DreamLight Constellation is quit. The width of this column may be adjusted by dragging the separator to the right of Scene Name in the Scene Queue table header. The Frame Range Columns consist of the First Frame, Last Frame and Step Frame columns as set in the Scene Panel when adding scenes to the Scene Queue. ScreamerNet LWSN only renders a single frame range. Any arbitrary ranges that may be set in the scene file will be ignored. The Percent Done column displays the percent of the scene’s frames from the frame range that has been sent to render nodes to render. This is currently based upon the last frame sent to render. In a future update DreamLight Constellation will track frames as they finish rendering, but this initial version tracks the frame render commands as they are sent out, just as LightWave’s bulit-in network render panel does. If you find DreamLight Constellation, DLI SNUB Launcher or our Mastering LightWave 3D ScreamerNet LWSN white paper and tutorials useful, please support our continuing efforts by registering DreamLight Constellation or registering DLI_SNUB-Launcher, by purchasing our Award-winning 3D CGI Short Film – BlastOff!™ Special Edition DVD, by purchasing some of our BlastOff! Merchandise or award-winning DLI SNUB Launcher logo merchandise or by buying our book: Creating a 3D Animated CGI Short. Thank you for your continuing support!